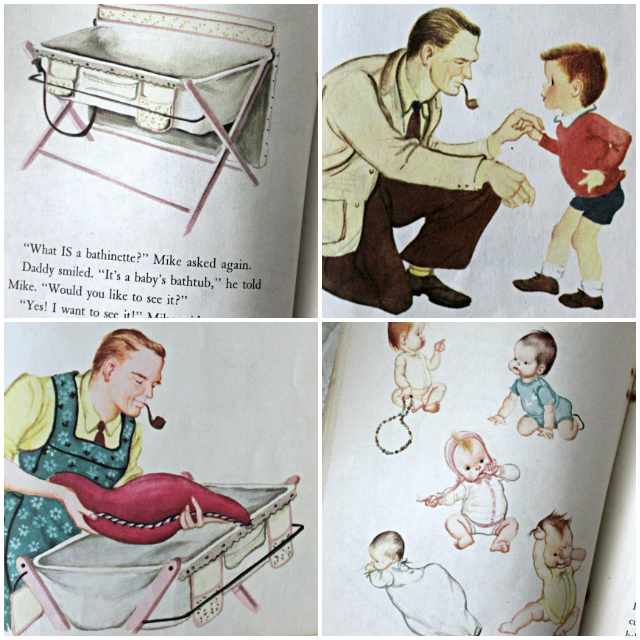 The New Baby (A Little Golden Book) by Ruth and Harold Shane, illustrated by Eloise Wilkin. Simon & Schuster, 1948. Yesterday Early, early this morning, I posted pictures of the 1975 edition of The New Baby, illustrated by my favorite Little Golden Book artist, Eloise Wilkin. As promised, here is a look at the original illustrations from the 1948 edition! Get ready to flip back and forth! As you can see, my copy is not in pristine condition. Little Golden Books were often much more text-heavy in the early days. Some books were later pared down for later issue. Have you ever seen an original copy of The Shy Little Kitten? I had a very damaged copy that was missing the first couple of pages, but it was interesting to see the differences between it and the copy in print today. The content was about the same, as were the illustrations. There were just so many more words. The New Baby of 1948 is a fascinating curio. Wilkin's illustrations were so different in her early career. They are cute, but cartoony. We meet little Mike, watching a delivery truck arrive, much the same as in the 1975 edition. Mike rushes in to see what the delivery man has delivered. Note Daddy's pipe and how not pregnant his lovely mother looks. Now, you may recall that in the later version, the package contains a baby buggy. Well, in 1948, the big box contained a bathinette - a special bathtub for the baby. Look at Daddy practicing to bathe the baby, pipe in his mouth. I love this sweet depiction of an old-fashioned American town. And now Aunt Pat comes to visit. In the 1975 edition, Aunt Pat is clearly Mom's sister. In this version, Aunt Pat is Mom's elderly aunt. Here we have two illustrations that Wilkin recreated for the 1975 version, the family dinner and the nighttime leave for the hospital. Mike has been told he has a new baby sister. He asks Aunt Pat if he can run next door to tell his neighbor, Mrs. Blair, and her daughter Susie. Mrs. Blair is a young, pretty neighbor in 1975, and Susie appears to be about Mike's age. Mrs. Blair isn't so young and pretty in 1948, and Susie is a baby. Mike is playing outside when the delivery truck comes back to the house. Just like in 1975, Mike asks Daddy and Aunt Pat if there's going to be another baby, because that's what the delivery truck meant last time. Of course, this package is actually for Mike. It's his big boy bed! The rest of the book is similar to the later edition. This proud little boy pushing the carriage illustration is very sweet. I just don't think it's as perfect as the final picture from the 1975 edition, Mike holding his new baby sister. Vintage art slays me. I love it so. It's very cute! I do prefer her later style of illustrating, but the early stuff is fun. Love this one too.. It's great to see these books compared and contrasted! I think I like the newest version best... But this one is adorable too... It's so funny that the aunt and neighbors all look so old in this one! I liked the 70s one best, too. That surprised me! This one is so quaint. Not only does she not look pregnant, but look at that waist! And Daddy and his pipe. Love it. I like the later version but this book is awesome in its own right as well. It is surprising how the mommy did not look pregnant at all! Was it maybe something society did not wish to see at the time? I wonder. The baby carriage picture at the end is endearing! Thank you for posting! The 1975 version is one of my favs and it was so interesting to see the older version!